Even as NFL training camps wind down in preparation for the 2017 season, there are still discussions about team building and what player would best suit a particular team’s offense or defense. There aren’t too many questions like that in an individual sport like mixed martial arts, but why not ask one of someone who is in the thick of the game like welterweight up and comer Bryan Barberena. As a former high school football star, the Arizonan is familiar with such analysis, so the question for Barberena, who faces Leon Edwards in Rotterdam this Saturday, is this: If he had to develop the ideal UFC competitor to be successful at the elite level of the sport, would he prefer to work with an athlete or a fighter? Barberena speaks from experience. Sure, he’s an athlete and has been for most of his life. But that fighter gene is the dominant one in his body. Just look at his UFC career thus far. In six fights, he’s won four, but it’s how he won them and who he beat that stands out. Joe Ellenberger was coming off his first UFC win and was expected to make it two straight when Barberena halted him in the third round in his Octagon debut. Two fights later, he handed highly touted Sage Northcutt his first pro loss, and four months after that, he beat hot prospect Warlley Alves in Brazil. But it was in his most recent victory over Joe Proctor in April that Barberena morphed from the “Prospect Killer” and the guy who will take one to give two into a legitimate threat at 170 pounds as he halted the tough New Englander in 94 seconds. 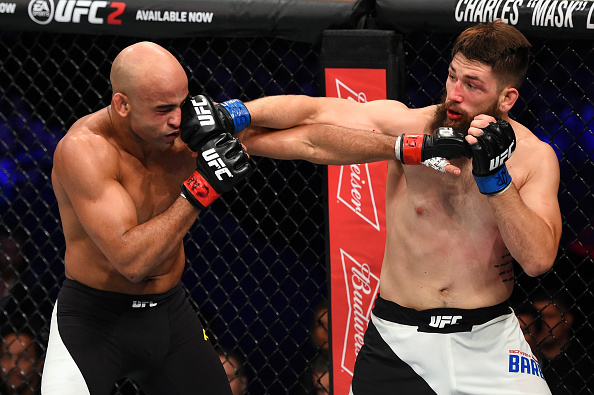 That work in the renowned MMA Lab in Glendale is obviously paying off for the 28-year-old, but even more than drills and adherence to the game plan, it’s Barberena’s mental game that is getting sharper and sharper. That’s the plan going into his first European fight against a similarly promising talent in England’s Edwards. The winner of this weekend’s bout will likely put himself on the doorstep of the top 15, and it’s clear that the UFC is now looking at Barberena not as the guy to test the rising stars, but to be a contender in his own right. They don’t get any easier from here. But Barberena has never backed down from a fight. It’s one he developed when bullied as a child and on the gridiron for Prescott High School. Now it’s paying off. And when you know the backstory, it’s no surprise that he picked the fighter over the athlete.